The classic British stage farce Charley's Aunt is given a Teutonic flavor in this 1956 release. The story is updated and the character names changed, but the plot, about a young man forced by circumstances to dress up as a middle-aged woman, remains intact. Heinz Ruehmann stars as Dr. Otto Dernburg (originally "Lord Fancourt Babberly"), whose friends Charley and Ralf are expecting female visitors. 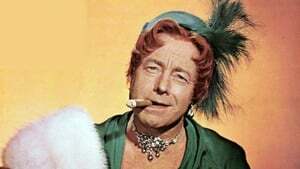 The girls won't show up without a chaperone, so Otto is inveigled into disguising himself as "Charley's Aunt, from Brazil, where the nuts come from." The comedy of errors and misunderstandings is played to the hilt, with time out for an unexpected musical number. Charley's Tante was one of Germany's biggest film hits of the mid-1950s.